A delightful spreading tree with bronze coloured leaves when young. A shower of pretty dark pink single flowers in early spring makes this tree particularly appealing and secondly, the leaves in autumn are a spectacular mixture of reds and golds. It flowers so early, it easily beats almost every other flowering cherry tree. Single flowers refers to the amount of rows of flowers, not it's relationship status which on the face of it sounds bizarre but we describe sexes in horticultural terms so why not if they are romantically available or not. We cannot guarantee that all Prunus Kursar flowers will be heterosexual. Should you get any signs of rainbow colours then you probably have a flower coming out of the closet. If you literally see a flower coming out the closet then you have planted it wrong. Expect Prunus Kursar to be popular with the bees so if you are into attracting wildlife into the garden then this is a good choice. The RHS have given this The Award Of Garden Merit, which means it must be a stunning tree or Prunus Kursar knows someone high up the garden allotment World. Originally bred by Captain Collingwood Ingram and named Kursar as he thought it was a cross between Kurilensis and Sargentii. Other possible names considered could have been Kurse which could be seen as passive aggressive overtones if gifted to the Mother In Law. Gentils was another possible name but this also could be taken the wrong way when speed reading. 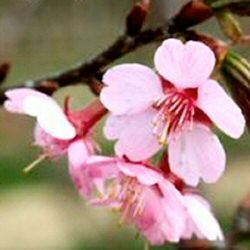 Prunus kursar is supplied at a height of 1.4m -2.40m and in a 7-15 litre container for year round planting. Any water marks on the foliage are dried tears from the Nurseryman as he has invested a lot of time and effort into making sure these are the best trees possible and became close to them. He might also have become close to them because the nursery aisles are narrow and he has put on some weight lately. We usually have this tree in 2 options which are explained below. If both options are not listed then we are out of stock of that option. 12 Litre : Comes as 150-240cm tall and 2-3 years old but may come in 10-15 Litre pot. Our Prunus Kursar are chalk and clay tolerant but if you have concerns over the quality of your soil then mix the excavated soil with 50% well rotted manure or compost. This is unlikely to be required. Dig the hole slightly wider and deeper than is needed as breaking the soil up makes it easier for the roots to spread. For best results, plant in full sun and say nice things to it when passing. Use root grow or other named product if you choose to so as to promote quicker establishment. A sheltered or exposed site will be suitable for planting Prunus Kursar, stay away from missile testing ranges. Considered fully UK hardy down to minus 20 degrees centigrade so if you accidentally put your 2m tall Kursar in the freezer for a short period of time, you would be ok. If rabbits are a problem in your area, you may want to consider using rabbit guards or renting a lion. Q Are there any medicinal qualities to Prunus Kursar? A. Only if you nail the first aid box to it. Q.	I want to plant Prunus Kursar close to the house, will the roots be a problem? A. No, Houses do not have roots. Q. Will Prunus Kursar help with global warming? A. Yes, take the whole tree and club all climate change denyers until comatose and wait for sense to prevail. Q.	I have heard Prunus Kursar flowers are so pink that they can be seen from space, is that true? A. Yes, provided you are an astronaut and you can sneak the tree onto your space vessel. Q. Will this tree help block out the nosy neighbours? A. As it is a small tree then definitely not unless your boundary is only 3 metres long. Attaching a smoke generating machine to the upper branches will be the only way a Prunus Kursar will block out the neighbours. Q. Will planting a Prunus Kursar increase the value of my house? A. Most likely yes. Plant and then check the value of your house in 20 years, it will most likely have gone up and the tree could have been the cause. Q. Will owning a Prunus Kursar increase fuel efficiency of my car? A. Definitely yes. Look at the branches on a windy day and drive in the direction they are bending. Stay where you are until someone tells you they are bending the other way and come home. Should the Kursar Cherry tree be out of stock then the Collingwood Ingram is a very similar tree, in fact it is a seedling from it. It has a deeper pink , flowers appear 1-2 weeks later and shares the same excellent Autumnal colours. See What Our Customers Are Saying About Our Prunus Kursar. Thanks for a very entertaining email. We love our cherry tree, and were very pleased with the customer service we received. Instead of selling us a dodgy end of season tree, trees-online sold us this lovely one a bit later in the summer. The leaves have turned a beautiful colour in the autumn and we just managed to get a photo before they all fell off. Looks like baby Caisley is already a fan From Alice, Peter and baby Caisley in Newcastle upon Tyne 1018 editors note ...Picture of tree and family shown on the left.